Posted on Tue, Mar 27, 2012 : 3 p.m.
Oberon, the summer wheat ale produced by Kalamazoo's Bell's Brewery hit shelves and taps across the state to much fanfare Monday. According to Forbes' Micheline Maynard, more than 60 Michigan bars celebrated by throwing "Oberon Day" parties. At least one Michigan beer lover isn't buying into all the hype, however. Entertainment reporter John Serba expressed his dissatisfaction with the beer Tuesday in a column on MLive. Explaining that the beer hasn't tasted as good since the named changed from "Solsun" and it started being produced in larger batches, Serba said that his new slogan is "Oberon - I’m Over It." You can read the full column here. Over on the Guyism blog, Oberon lovers celebrated the release with "9 terrible haiku to celebrate Bell's Oberon release day," written on napkins and scraps of paper. What about you? Do you toast spring with a nice cold glass of Kalamazoo's finest, garnished with a slice of orange? Or does the whole spectacle leave a bitter taste in your mouth? Jessica Webster leads the food section for AnnArbor.com. You can reach her at JessicaWebster@AnnArbor.com. Wed, Mar 28, 2012 : 5:10 p.m. I am a friend of all beers, but the best beer, is free beer. A few more syllables, and you would have had a haiku of your own there. Wed, Mar 28, 2012 : 3:06 p.m. 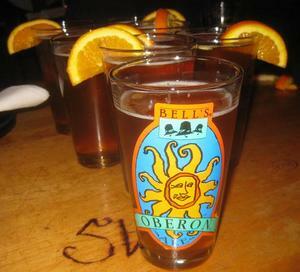 If you don't like Oberon that is certainly your prerogative. But there is no reason insult the rest of us who happen to love it and celebrate its arrival every year. Beer, by its very nature, will vary from one batch to the next.... which, again by definition, means that some batches will be better than others. None of them, however, have ever been bad. Bell's has a winner in Oberon. LIke it or not, it's one of Michigan's defining beverages. A cold Oberon (or two...or three) consumed on my front porch on a warm Saturday afternoon is just about as enjoyable as it gets. Sure, there are Bell's offerings I enjoy more (Oracle and Expedition Stout) but it's a dependable option that won't knock me flat after one bottle. I've also found that it's often the only microbrew on tap at bars where the only other drafts are of the lager-water variety, in which case, I'll have a pint, please. Wed, Mar 28, 2012 : 10:29 a.m. Isn't &quot;beer snob&quot; a contradiction in terms? Wed, Mar 28, 2012 : 1:09 a.m. Wed, Mar 28, 2012 : 12:30 a.m. Wed, Mar 28, 2012 : 4:11 p.m.
We are awfully lucky. We drink Michigan beers almost exclusively at my house. Tue, Mar 27, 2012 : 10:42 p.m. I don't hate Oberon, but I'd rather have a good IPA. Tue, Mar 27, 2012 : 10:40 p.m. The problem is that Oberon DOESN'T leave a bitter taste in my mouth. Tue, Mar 27, 2012 : 8:43 p.m.
To me, Oberon is one of the perfect Michigan sprin/summer beers. It might be overrated because everybody knows about it, and it may not be the best beer out there, but it is a damn good beer on a warm spring day! Tue, Mar 27, 2012 : 8:13 p.m.
Agree something has changed in Oberon over the years &amp; not for the better but have no idea what process they used to have vs one they have now. I remember it being awesome in 2006. Two Hearted was also wicked but haven't tried it in a year. Wed, Mar 28, 2012 : 5:15 p.m. I agree. I was over Oberon two years ago. Tue, Mar 27, 2012 : 7:47 p.m. I'm not into wheat beers all that much. Weather seems to have no effect on me. I'll still select an IPA or a wee heavy. Tue, Mar 27, 2012 : 7:44 p.m. I like it, that's all that counts! You have to love the snobby one's, they can chew their gross beer all they want, I mean, some one's got to drink it! Then there's the lite beer group....what's the point?! Tue, Mar 27, 2012 : 7:35 p.m.
After downing two of any beer the rest taste great no matter what. As for Mr. Serba, to quote Ed Norton, &quot;What a grouch!&quot; Yes there are better of this genre, Arcadia's Whitsun being one. But let us fancy sitting in our backyard, feeling the warmth of the sun on our face, listening to the Tiger game and drinking Oberon until the cows come home.